In a landmark judgment on 28 Septemeber 2018, the Supreme Court granted women's entry to Kerala’s Sabarimala temple irrespective of their age. Sabarimala to me is more an issue of gender equality than of religious freedom. Those who oppose the entry of women there do not even have the backing of custom as the ban on women of a particular age in the temple only goes back to the High Court judgement of 1992, and even after that there is enough proof to show that young women have entered the temple with the full knowledge of the Tantric, the chief priest. The custom, if at all it exists, militates against the gender equality guaranteed by the Constitution and hence needs to be discontinued. The real battle is between the regressive feudal forces that stand for Brahmin hegemony and royal power and the progressive forces of democratic equality. This temple is a major source of income for the so-called called “kings” of Pandalam— that had long ago become a part of the Travancore Kingdom and later of democratic Kerala—as also for the Tantri. They do not want to be deprived of it. Historical records show Ayyappan as a tribal god worshipped by the Malayalam tribe. Clearly it was later brahminised and the legends were rewritten for the purpose. Sastha, the other name of Ayyappan, is a synonym of the Buddha and the Sarana chanting of the pilgrims is also Buddhist. The fact is that the whole issue is being politically manipulated by the right-wing that is unhappy about Kerala's rejection of its Hindutva ideology. I completely support the decision of the Supreme Court and the Kerala Government's efforts to implement it which is its constitutional obligation. It’s all about constitutional right for women. Even in the judgement, the clauses that they site are from the constitution. The first point that it mentions is about freedom, the second on non-discrimination, while the third is equality. The whole question of non-discrimination corresponds to untouchability – purity. It’s the fundamental right that underlines the judgement on women. An altered narrative, underlying a whole range of political agenda has been presented by media after the Sabarimala verdict. The whole narrative that is echoed today consists of three constitutional forces coming together—the royals royalty, the princely section, and the Nair Service Society along with who they represent. This agenda is propagated by the right-wing and this is for the first time in the history of Kerala that people are promoting an anti-women agenda. We can see the elite, patriarchal and brahminical sections of society coming together and projecting themselves as the “Hindus” protecting the temple. Recently, the adivasi section had also come up with a historical evidence of how Sabarimala- a tribal temple, had been taken away by the upper caste. Mainstream narratives such as these are also shrinking the space for a democratic dialogue. We need to create a democratic space to discuss such issues rather than lashing out and as an attempt to achieve the same, we have formed Samam, a forum for gender equality which consists of people from various fields. 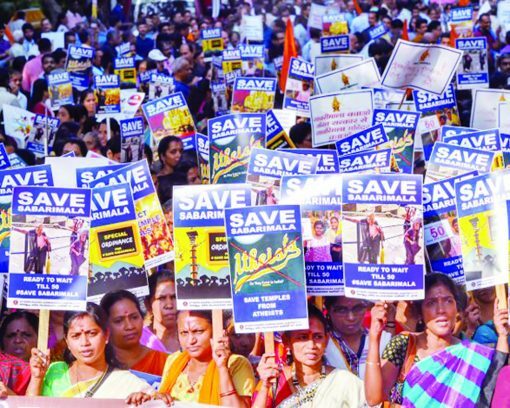 The protests against women’s entry in the Sabarimala temple were mostly marked by violence and meticulous planning. It was an attempt to fasten Kerala to some parts of India, which are inclined to Hindutva ideology. It was an assault on the idea of Kerala that is founded on secularism, pluralism and peaceful coexistence. It is unlikely that the situation will resolve so easily.